Pumps play a main role in water & wastewater treatment plants and pumping stations, Ease of maintenance & repair are an important consideration for those responsible for keeping pumps in good working condition, Pumps in pumping stations get waste from its source to the treatment plant, pumps are used to move influent, raw water, primary sludge, secondary sludge & return activated sludge through to final effluent. Centrifugal pumps are used in wastewater treatment plants and pumping stations, the dry-pit solids handling (or non-clog) pump with a flexible drive shaft and motor above grade was quite possibly the most popular style of the pump at the WWTP (Wastewater treatment plant) and PS (pumping stations). Dry-Pit Pumps are popular & found in operation across North America, They are built below ground, pumps (usually vertical) with flexible drive shafts and above grade air-cooled motors are installed in a dry well, adjacent to a wet well, There is a superstructure to allow personnel access to the dry well which houses electrical and other equipment required to run the station, these types of heavy duty centrifugal pumps have proven to be the rugged, reliable, work-horses of industry. Dry-pit pumps (centrifugal) are not submerged into the wastewater, So, maintenance personnel can see, touch, listen to & easily repair the pumps, This makes them easier to repair, and reduces the amount of time required to diagnose and correct a pump failure, There are fewer health & safety risks associated with repairing dry-pit pumps as well. Since they are not submerged, they’re not covered in sewage, Dry wells themselves provide space required to manoeuver & provide protection from the elements, The drawback of the dry-pit pump is it is below ground level and always susceptible to flooding. Dry-pit submersible stations are growing in acceptance & popularity for dry-pit applications, The dry-pit submersible pump station is not entirely different from a dry-pit station in that it still has a dry and wet well, however the pump configuration, particularly the motor is different, the motor is mounted directly to the pump, eliminating the intermediate shaft, The motor itself will circulate either sewage or glycol (superior to sewage) to cool the motor, which is designed to run continuously in air as well as submerged. Dry-pit submersible pump (centrifugal) offers full protection against station flooding, The close coupled motor eliminates problems associated with flexible drive shaft breakages, Many conventional dry-pit pumps can be easily retrofitted to dry-pit submersible quickly & cost-effectively. Some drawbacks of dry-pit submersible can be related to motor failures in sewage cooled style motors, Particles from the sewage settle out and if not properly flushed/cleaned can lead to overheating of the motor, Glycol cooled CLC motors are far superior & virtually maintenance free, Retrofitting an old dry-pit pump installation with a new dry-pit submersible pump doesn’t always match up which can be inconvenient & expensive to change. Self-priming pump will continue to move water like a standard centrifugal pump and it gets rid of the air, It can’t operate without water, It can handle a variety of fluids, it operates well with slurries, corrosive fluids, and solids, It is easier to operate, but it has its limitations, All centrifugal pumps need to be primed before operation, It can overcome the problem of air binding by mixing air with water. 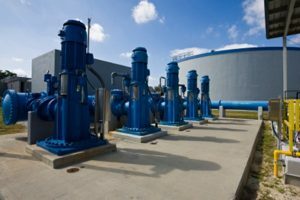 Solids handling is one of its most important benefits, as some self-priming pumps can handle solids up to 3-inches when compared to a submersible pump, Self-priming pump can continue pumping fluid while the pump is still situated out of the pit. The drawback is its inefficiency, as clearances often need to be larger to allow for better solids handling, also a larger volume to assist with self-priming, self-priming pumps come across various issues with continuous functioning, The main problem in a centrifugal pump occurs towards the pump’s suction side, and it needs re-priming. Self-priming pumps need to be primed again following the initial priming, This is to ensure optimized operation due to multiple factors such as fluid evaporation during initial priming, The pump should be as close as possible to the suction source, Usually, 7.6 to 9 meter (25 to 30 feet) is the maximum recommended distance. The suction line of a self-priming pump is always below the atmospheric pressure, So, some air leakage might occur, one should have a suction line at 0.5 metres (20 inches) of vacuum when the pump is functioning.